LED Strip Studio > General > Who we are, what we do? In 2009 my business partner bought 2m of digital LED strip while visiting an exhibition in Shanghai. I remember that I used a few bad words for spending money on such a ,,stupid stuff” back then. Anyway, it really turned out that I was wrong, and in the last 4 years we’ve developed complete control system for video and analog LED strips called LED Strip Studio. It’s been using to control LED lightning in almost every Czech and Slovak TV show, and controlling lightning in Got Talent and X Factor shows, also. Why we’ve developed LED Strip Studio brand? The reason was simple. 5 years ago there was no software, which could handle up to 40 000 and even more LEDs what we needed for our installation. 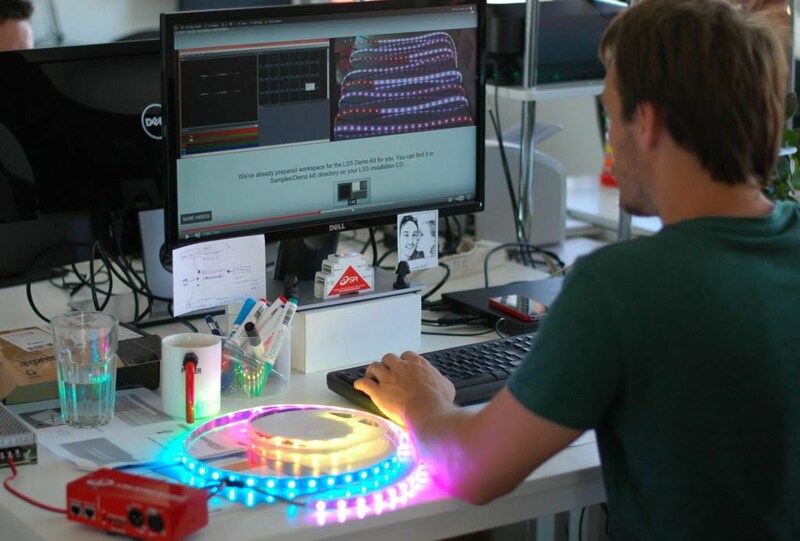 Also, we required to create any-shape LED screens made using digital LED pixels or LED strips. This is quite hard still in these days, anyway. One of our very first project we’ve finished was the Cylinder screen used for advertisement. We didn’t know back then, we’ll call the brand LED Strip Studio. But it was working on the same principle. There were about 8 000 LEDs used for this project and it was running 24/7 for about 5 years. You could say: ,,Quite tough for the first project ? “. We did also installation for one of the most important clubs in Barcelona. Unfortunately, we don’t have more photos and videos of the club, just this one I took immediately after the installation was finished. It shows the most important feature of the digital LED strips – you can cover almost anything by using them and make it on screen! However, the most important installations we did after that – and most of them for the TV studios and TV shows. Just prepare to read about it in our next post.